Book number 4 down on my summer reading list. I am a little behind on my reading and have added several new books along the way - including Harper Lee's Go Set a Watchman that I seriously can't wait to get my hands on next week. Are y'all excited to read it? To Kill a Mockingbird is one of my all time favorites and I can't wait to meet Scout 20 something years later. 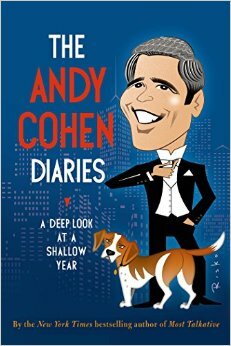 On a lighter read the Andy Cohen diaries was an adorable breeze. I loved his first book and this one just makes me like him even more. Such a fun look into his year and all the interesting people he comes into contact with through his job. I love that he got his first pet Wacha and how much that seems to open him up. I love a good celeb book and his makes me want to read all of them plus he is hilarious. If you like a fun glimpse into celebrities and tons of great interesting stories you will enjoy his book. A super fun easy read. I really want to get J.Los next - I have heard it is fantastic? Look I have my high and my low levels of reading ok - don't judge!